NASA NA CD Release 26-05-2016! 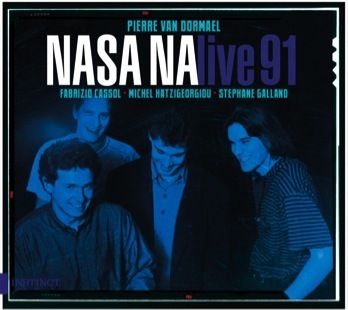 NASA NA was composed of Pierre Van Dormael, Fabrizio Cassol, Michel Hatzigeorgiou and Stéphane Galland. 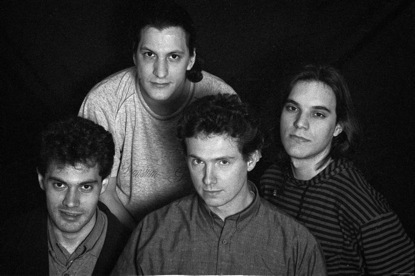 The group was formed in the summer of 1988 during the free jam sessions at the « Travers ». NASA NA developed with the opening of the « Kaai » where they played every Wednesday. At this club, experimentation was key. Featuring exceptional young musicians, who would all go on to develop stellar careers, this energetic, innovative and unpublished jazz music has kept all its brilliance. It is finally available on CD! It also presents a fine opportunity to savour Pierre Van Dormael’s improvisatory talents in concert. 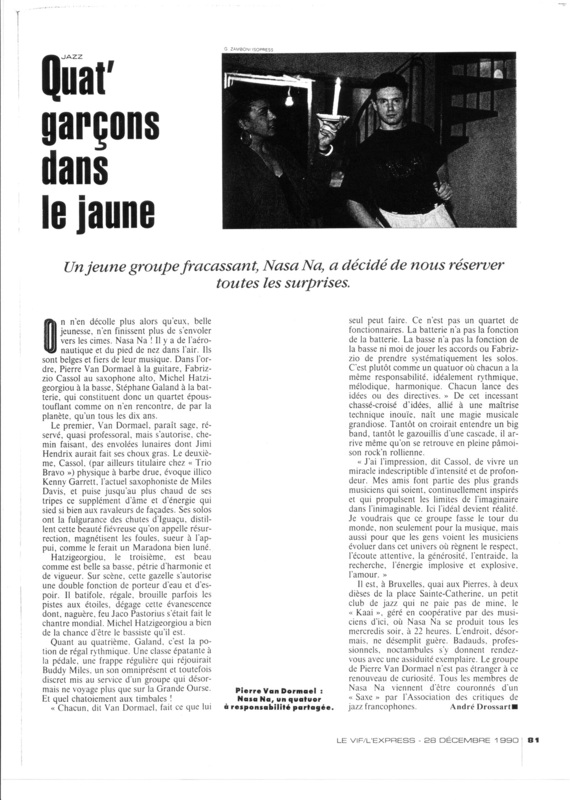 NASA NA, composé de Pierre Van Dormael, Fabrizio Cassol, Michel Hatzigeorgiou et Stéphane Galland, se forme durant l’été 1988 lors des jams libres du « Travers ». Le groupe se développe avec l’ouverture du « Kaai » où il jouera tous les mercredis. Dans ce club, tous les risques sont permis. De jeunes musiciens d'exception qui auront les belles carrières qu'on leur connait, un jazz novateur qui fit le bonheur de nombreux amateurs, une musique énergique et inédite qui est restée géniale... enfin disponible en CD! Ce disque est également une occasion exceptionnelle d'entendre le talent d'improvisateur de Pierre Van Dormael en concert. NASA NA was formed in the summer of 1988 during the free jam sessions at the “Travers”. Initially named NASA NA GROUP, which means “I have a group”, NASA NA developed following the opening of the “Kaai” during the spring of 1989. At this jazz club, experimentation was key. The “Kaai” would turn out to be the breeding ground of a whole series of artists who had the desire to share new experiments in music. NASA NA was the convergence of four powerful musical personalities: Michel Hatzigeorgiou, already connected to Jaco Pastorius and Toots Thielemans; Fabrizio Cassol, coming from the Trio Bravo and different styles of contemporary music; Stéphane Galland, just turned 21 and arriving from a slice of New York life; and Pierre Van Dormael who, following numerous projects including Natural Logic, a quartet with Steve Coleman, Bob Stewart and David Linx, had just recorded the James Baldwin project A Lover’s Question. Alongside its numerous concerts, NASA NA played at the “Kaai” every Wednesday evening, with ample room for freedom during improvisations. Each musician had ideally the same responsibilities as to rhythm, melody and harmony. No one was ever replaced; they played not only in quartet but also in every possible combination of trio, duo and even solo. Nasa Na never rehearsed in the usual sense of the word; the music created itself directly on stage, in symbiosis with the audience. For Pierre Van Dormael, the combination of personalities inside NASA NA opened the way to original improvised musical developments, perpetually renewed playing in which harmonic tensions and resolutions are interlaced and infinitum. His art could be symbolized by a triangle in which the evidence of simple emotions, intellectual rationality and the search for spiritual expression find a thoroughly natural connection. 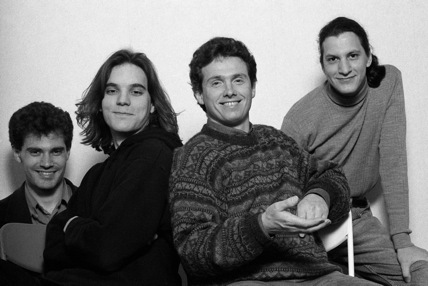 When the group dissolved in 1992, Fabrizio Cassol, Michel Hatzigeorgiou and Stéphane Galland formed Aka Moon. Pierre Van Dormael would occasionally join them for concerts and recordings. NASA NA turned out to be a springboard for Aka Moon, and Pierre Van Dormael was probably the first to be aware of the force conveyed by his three cronies. Despite the public’s expectations at the time, this ‘laboratory group’ released no album, even though its members would all have great careers. That absence is now made up thanks to this disc event consisting of live recordings from 1991. Here you will discover music that is resolutely modern, based on the simple, formal principles of the jazz tradition: exposition of the theme in unison, successive solos, and the reprise of the theme to conclude. The long moments of taking turns allow for making a musical language proliferate and evolve constantly, relying on a melodic geometry rarely heard at the time. The beauty of this melodic language makes each composition a manifesto of timeless modernity. This album also pays homage to that very great musician and composer Pierre Van Dormael and is a unique sound document bearing witness to his genius. NASA NA symbolized some of his musical ideals: expressive freedom, an important improvisation space, a sort of availability towards a future in which everything is created in the instant and always in front of an audience, in special moments of sharing. NASA NA Live 91 represents a missing link that had to be brought to light and which has kept us waiting quite a while, attesting to music that has preserved all its freshness.